My son grips my sweaty hand as a guard ushers us into the hospital with a flick of his fingers. “Bonjour,” I say, then, for good measure, “Salam.” I don’t want to do anything, say anything, to mess this up for my sister. In a failed attempt to be invisible, my 9-year-old ducks his blonde head, which draws so many stares in this city of dark hair more like my own. He’s nervous and shy and, not having slept for two days, exhausted. We follow my sister down a white concrete hallway, past a row of billing windows and a small café where patients buy food, to a wide gray stairway at the far end of the building. There are no wheelchairs in sight here, no stretchers. Patients, the ones too sick to walk on their own, are draped over their relatives’ backs. An older child in pajamas rides his mother up the stairs in front of us. The mother is breathing hard, sweating from the load and the 90-degree heat, as she drags the two of them up the stairs. There are tiny circles of blood on the steps, but we shuffle around them. The woman and her child turn into a hallway marked pédiatrie, but we keep climbing until we reach the fifth floor at the top of the hospital. Straight ahead of us is an intensive care ward for infants where two tiny abandoned twins struggle for life. By the end of the week, one will have died, shrouding my sister and me in a shared sadness that we don’t even need to speak aloud. Another hallway bears right, and my son and I follow my sister to a closed door that marks the entrance to the orphanage. Once inside, my sister is all business, talking to the nurses in Arabic and shepherding us into a pale pink room lined with mattresses on the floor. 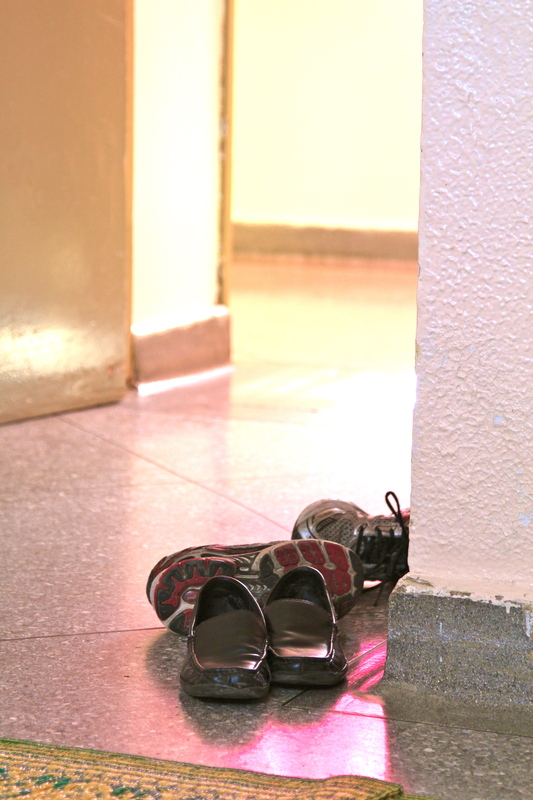 “Shoes off,” she directs, and we leave our shoes at the doorway before sinking onto one of the mattresses. My son leans against my shoulder; he’s practically sitting on top of me. 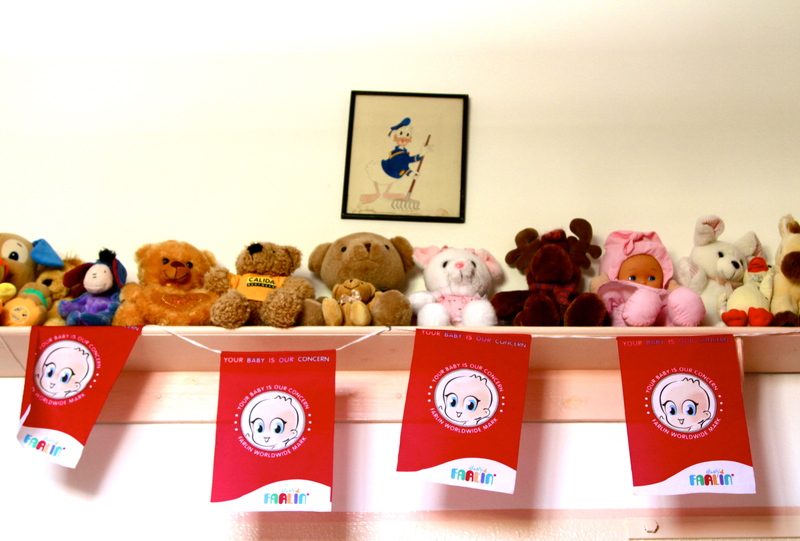 On two sides of the room are long white shelves, which hold an assortment of stuffed animals and dolls. A few of the toys have tumbled down and are twisted in the blankets on the mattresses. My son fingers the ear of a bear while we wait. Finally, a nurse, the one who calls herself “First Mama,” the one my sister will tell the baby about when he can no longer remember, carries him in, and we rise to greet her. She hands the baby to my sister, then looks at me. The nurse’s face breaks into a smile, and she begins talking rapidly in French. Even though I can barely make out what she is saying to us, I recognize that bright look in her eyes, the way her eyebrows arch upward, the way she nods in delight. Deux sœurs jumelles. Yes, I nod. Twin sisters. Once the baby is in her arms, my twin sister buries her nose in his neck and sniffs, the way I buried my nose in my five-year-old just before I left him. “What are you doing?” he asked me. “Smelling you,” I told him, “taking a big breath of you with me.” “Let me do it to you!” he instructed, and then his sticky lips were all over my neck, making me laugh. “Got it,” he said, then let go. “Hi, baby,” my sister says to the bundle in her arms. “It’s Mama.” The baby looks back with big brown eyes, intently studying her face. “He knows you!” I exclaim, and he quickly turns his head toward the sound of my voice, the way my infant children always turned to my sister in confused recognition. Nearly ten years ago, when I became a mother for the first time, I understood more than ever what it must have been like for my birth mother to let my sister and me go. Never before had I considered that relinquishing us might have caused her irrevocable pain, such a permanent wound, not just from being separated from us but from not knowing where we were or what had become of us. But now, in this moment, on the other side of adoption, I understand something else more deeply than I ever have: I understand what my mother must have felt when a social worker first placed us in her arms. I understand how the minute my mother laid eyes on us, we were hers. No matter that we had not emerged from the depths of her body; we had emerged from the depths of her love. That first gaze was a lock, and once we were in her arms, we were hers, just like that. We were hers. Given the journey my sister took to get to this moment, to this baby, I also understand something about the fear that plagued my mother for the first few years of our lives, the fear that despite what she felt in her heart, despite the fact that her love began immediately, it might not be enough to keep us. I understand, too, the courage that adoption demands from all of us, not just in the beginning but in the lives that follow. On the top floor of a hospital in a world so far, yet so near, to my own, my sister is bursting with that courage. It pours from her being. As I watch her cradle her son, I am filled with so much admiration and love for her that I can barely stand. The room is whirling. “Here,” my twin says, handing me her baby. I take my nephew into my arms and, just like that, make him mine, too. I am your mother’s friend Mary from Traverse City, MI. I have read all your blogs and am touched by the emotions that stir within me. You are a beautiful writer who makes me more aware of the searching for peace within the hearts and souls of adoptive children. Your birth mother loved you so much that she was willing to give you and Jackie up so that you could experience a life far better than she could have given you at the time. God Bless that woman, and God Bless Donna and Dave for welcoming the two of you into their hearts and raising you to be the women you are today. Keep on writing, girl! Thanks so much for your kind words, Mary. My mom speaks so highly of you. Your words mean a great deal to me! OMG! Jenny that aches my heart, I know Jackie very well, strong, and Kind both together, she will give every thing to that baby, raise him the best way she can, and that will be the best, Jackie will be a great wonderfull Mom, and will never leave a spot of doubt for her Child I know. Beautiful piece and so true – speaking as an adoptive mom. That’s how it happens. Weird and magical. Jackie probably will be dismayed to hear this, because she’s such a private person….but one of the things I like most about your blog, Jenny, is that I feel like I finally get to see through you glimpses of what Jackie is thinking and seeing and feeling. We’re all excited for her back here in Chi. We, too, are in awe of her courage and can’t wait to meet him!